I would like to thank Ben Verwaayen, the Chief Executive of BT for an excellent and thought-provoking speech at the Conservative Technology Forum event that his company sponsored at St Steven's Club in London last night. I did actually record the whole thing and I need to find a moment to transcribe it into an article. 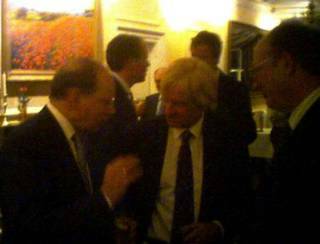 You can vaguely see Ben having a conversation with Shadow Technology Minister, Michael Fabricant (MP) and Malcolm Harbour (MEP) in the digital camera photo below. I've now been given the "Policy" role as Vice Chairman of The Conservative Technology Forum, which is, to say the least, an interesting challenge. So far, I'm buried, writing a report on intellectual property (IP) copyright legislation and I'm hoping to be able to write three or four more detailed reports of this type in the next twelve months. Certainly Ben Verwaayan gave me some ideas. My long association with Computer Weekly, will, I'm told, come to an end in December. I've lost count of the thousand of words I've written in "Thought for the Day" but CW, has had enough thoughts for now, so you'll have to find me here or maybe somewhere else that has an enthusiasm for satirical writing on new Technology. Good IT magazines are hard to find these days. In this aggregated world of ours, many if not most can't afford to employ experienced journalists and columnists anymore, which is why a number of the really good ones are eking out a living with "day jobs" as well. I need to get my hair cut, I'm starting to resemble Boris Johnson. In fact, I mistook Boris's father Stanley for him last week in some rather dim light, which says a great deal about my eyesight. That said, I've spend the morning revalidating my instrument (IMC) rating, stumbling around the skies somewhere between Dover and Lydd in the first really cold morning of the winter. The first time I've experienced real carburettor icing at a high cruise setting in an aircraft. As for my flying, I think Clive, my examiner is right. "No more right to an IMC rating than a weasel but keep practicing", so thanks for signing me up, as I don't really deserve it.